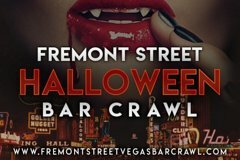 In search of the hottest parties this Halloween on Fremont Street? We have you covered with the most epic Downtown Las Vegas pub crawl! Come party with us this Halloween in Vegas when we visit multiple venues in one night, with exclusive perks including drink specials, express entry, and no cover charges. We’ll take you to the hottest Halloween parties in Old Vegas. Let us be your guide to navigating the best Downtown Las Vegas Nightlife!